For Miami Dade College Wolfson Campus student Diego Almaral, watching Venezuelan protesters being shot at and beaten in the streets of his country Is painful and personal. Like many Venezuelans abroad, he is trying to raise awareness about the situation. “Even though I am far from my homeland, I will continue to fight for the good of my people,” Almaral said. The Venezuelan protests sprang from dissatisfaction with living standards, a hobbled economy and high crime, as well as from the frustration of government opponents who felt shut out of the political system, The New York Times reported. President Nicolás Maduro dismissed the protesters as coup-plotters and fascists. Almaral hopes to raise awareness of the violence there by leading the newly formed Venezuelan Student Association at Wolfson Campus. 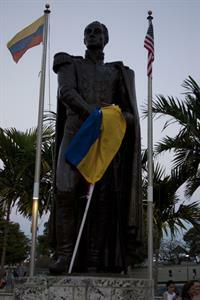 It is a chapter of the Venezuelan Student Alliance at Florida International University. The Wolfson Campus currently hosts 166 Venezuelan students as international students, according to the Office of International Students. The new club will host its first event, a lecture and student discussion entitled “S.O.S. Venezuela: a country in crisis,” on March 27 in Room 3208-09 from 5:40 p.m.– 7 p.m.
Venezuelan students at multiple MDC campuses have been touched by the turmoil in the country and are expressing their dissatisfaction. Many are showing their concern for their country by wearing T-shirts with messages in solidarity with the protesters, sporting Venezuelan flag pendants, painting S.O.S. Venezuela on their cars and attending rallies in Miami. Voicing their support for the protesters and raising awareness about the government brutality is just about all Venezuelans here can do. The Venezuelan government closed their consulate here two years ago in a diplomatic dispute leaving the estimated 300,000 Venezuelans here without consular services and protesters without a direct focus. On a recent balmy night in downtown Miami, more than a hundred people wearing white as well as the red, blue and yellow colors of the Venezuelan flag crowded around a statue of the 19th century Latin American independence leader Simón Bolívar for an S.O.S. Venezuela rally. The statue was a significant reminder of Bolivar’s key role in freeing Venezuela and other surrounding countries from oppressive Spanish colonial rule. “If in Venezuela, they march 365 days of the year, we too have stand up for them,” Andrea Martini told the crowd in Spanish through a megaphone, her voice full of ardor. This candlelight vigil began at 8 p.m. and included singing the Venezuelan national anthem and commemorating fallen student protesters. S.O.S. Venezuela en Miami, a Miami-based activist group working for human rights in Venezuela facilitated the largest demonstration of anti-government sentiment on February 22 at J.C. Bermudez Park in Doral, attended by thousands. The Bayfront Park demonstration marked one month since the February 12 anti-government protests in Venezuela garnered global attention when three protesters were killed. Doral is known for its high concentration of Venezuelans and MDC’s West Campus has a large Venezuelan population. ”Some of these students held a small rally at the campus that showed their solidarity,” said Ana DeMahy, Director of Administrative and Student Services at the West Campus. 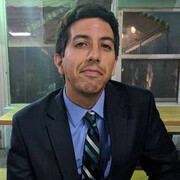 Zacharias Cohen, a Venezuelan student at Wolfson Campus, is disturbed that the Venezuelan army has been using tear gas and rubber bullets against their own people. He notes the irony, that the force has “guardia del pueblo” (guardian of the people) inscribed on the back of their uniforms. Cohen said life in his oil rich country is unstable and chaotic with mobs of customers invading supermarkets once their stock comes in. The availability of basic goods like sugar, butter, milk and flour (used to make arepas, a Venezuelan staple) are limited, with supermarkets placing signs such as “1 kilogram of powdered milk” per person. Cohen’s own friends are victims of the increased crime. He describes Venezuela’s recent history as a bubble that was waiting to burst.